This research was an empirical study intended to analyze the influence of Working Ethics of Islam toward Organizational Commitment, and the influence of Organizational Culture, Organizational Commitment and Human Resource Competence toward Employees’ Performance. This research was conducted to the employees in 6 General Banks of Syariah in Indonesia (Makassar, Palembang, and Semarang). The research problems were answered by Empirical Research Model with 5 variables and 23 indicators for research hypotheses were formulated. The data were obtained by questionnaires that were directly distributed to the respondents and via post and contact person. 250 questionnaires were distributed and after editing process, 219 questionnaires were considered valid. The data were analyzed by Structural Equation Modeling (SEM) with software LISREL v.8. 54. The result of hypotheses test based on Critical Ratio Value and Probability Value indicated that: the variable of Organizational Commitment was influenced significantly by the independent variable of Working Ethics of Islam with correlation value 0.27; the t-test value was 3.18. The variable of Employees’ Performance was not significantly influenced by the independent variable of Working Ethics of Islam with correlation value 0.09; the t-test value was 1.39. The variable of Employees’ Performance was significantly influenced by the independent variable of Organizational Culture with correlation value 0.36; the t-test value was 6.48. The variable of Employees’ Performance was significantly influenced by the independent variable of Human Resource Competence with correlation value 0.19; the t-test value was 3.29. The variable of Employees’ Performance was significantly influenced by the independent variable of Organizational Commitment with correlation value 0.63; the t-test value for this independent variable was higher than 1.96, namely 8.41. AKOB, Muh.. ANALISIS ETIKA KERJA ISLAM, BUDAYA ORGANISASI, KOMITMEN ORGANISASI, DAN KOMPETENSI SUMBER DAYA MANUSIA TERHADAP KINERJA KARYAWAN (Studi Empiris pada Karyawan Perbankan Syariah di Indonesia). 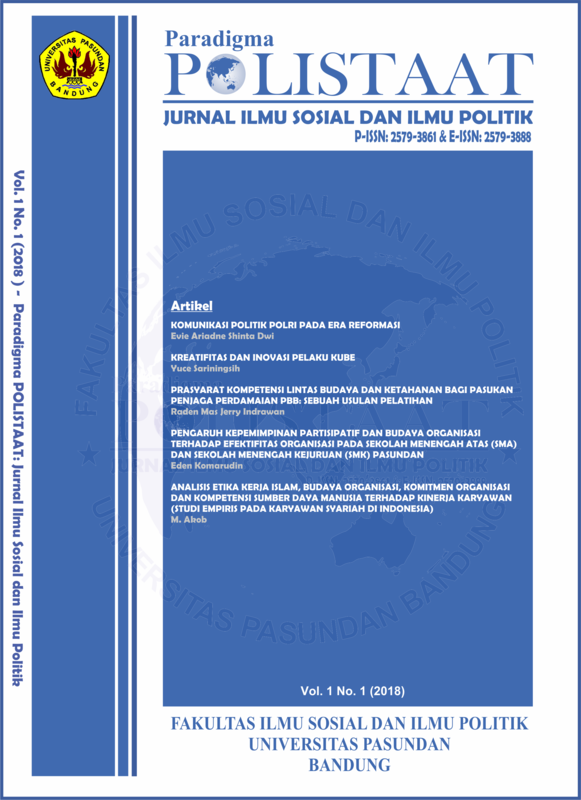 Paradigma POLISTAAT: Jurnal Ilmu Sosial dan Ilmu Politik, [S.l. ], v. 1, n. 1, p. 80-101, june 2018. ISSN 2579-3888. Available at: <http://journal.unpas.ac.id/index.php/paradigmapolistaat/article/view/519>. Date accessed: 25 apr. 2019. doi: http://dx.doi.org/10.23969/paradigmapolistaat.v1i1.519.